You have reached the OutdoorNI.com Easter blog for 2013 but don't worry there's still plenty of Easter family adventures happening this year too! Check out our latest blog Easter Family Adventures in Northern Ireland 2014 for loads of ideas to keep the kids amused this Easter. Who says the kids should get to have all the fun?! Join in with them and see who can stand up first and ride the waves into the shore. Alive Surf School is offering 2 hour surf lessons including all equipment and a free snack and drink for just £15 when you quote ‘OutdoorNI.com’ when booking. Enjoy the memorable experience of seeing our beautiful coastline from the sea. Witness the glorious sandy beaches of Portrush as you zoom across the water and experience the North Coast like never before as you take in the glorious sights of Ramore Head, the Skerries, Dunluce Castle and Island Doo. This is one sightseeing trip that will definitely not leave the kids bored. 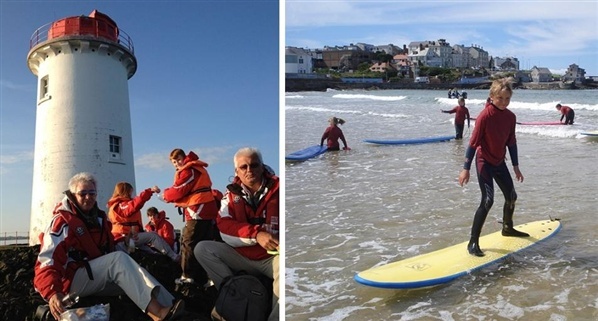 Surfing, beach games, safety and an experience the children will remember forever! Leave the kids to have fun on the beach while you go away and relax for a couple of hours knowing they’re in safe hands. Add into the mix a special kids Easter egg surf hunt on the 1st April and a whole day of fun on the beach with the kids big day out on the 5th April and you’ll have no problem keeping them amused over the break. Relax and chill out while the kids hit the waves, learn how to surf and meet new friends at The Troggs Quicksilver Kids Surf Camp. No experience is necessary and video footage of the surfing is included so everyone can relive the fun. An exciting, friendly and fully supervised learning experience - the kids are sure to be talking about it for ages! Make sure to check out BeachNI.com for even more ideas on which beaches to visit this Easter. It mightn’t be the best weather we’ve ever had at Easter but that doesn’t mean you have to hide away indoors! There are loads of fantastic family events happening over the Easter period and with the activity providers providing everything you need to have a good time there’s no excuse for not getting outside and having some family fun. Departing Strangford Village, travel up the lough through the ‘Narrows’ to Angus Rock Lighthouse on Clearksky’s Sea Safari. After tying up the boat on the ancient quay there will be time get out and explore this stunning location rich in wildlife with fantastic views across to the Isle of Man and the Lake District. What better place to sit and enjoy a picnic?! With climbing, zip line, archery and kayaking sessions available you will have no problem filling up the weekend. The kids are sure to be left screaming for more just as well then that Carrowmena are offering buy 2 full days, get 1 free. Suitable for ages 6 and up. If you’re in search of some spring time fun then look no further than the JungleNI where a fun packed and affordable family fun day of events awaits with activities starting from just £3. Race to the top of the climbing wall, try to hit the bullseye in their paintball and archery target ranges, or try out a spot of body zorbing, take a boat ride and of course hunt for some easter eggs. Canoe or kayak on Strangford Lough, see who can climb the highest on the outdoor climbing wall, have a go at archery or try out grass sledging. For just £3pp per activity these great value activities are not to be missed! Set in the grounds of the stunning Castle Ward Estate this easter adventure camp promises to send the kids back tired! Activities range from climbing and bouldering to canoeing and archery and are suitable for 8-15 year olds. Don’t panic if you don’t have time to drop them off, Clearsky are running a free shuttle bus service from Newcastle, Strangford and Downpatrick each day – we have a feeling this is one bus they won’t be late for in the morning! Make sure to check out OutdoorNI.com for even more family fun for you and the kids this Easter. You've reached the Northern Ireland Adventureland Blog for 2013 but don't worry this fantastic weekend of half price and discounted events is back for 2014. Check out our Northern Ireland Adventureland Weekend family blog for 2014 for a whole host of fantastic family events happening on Sat 5th & Sun 6th April 2014. You’re never too young to have an adventure that’s why as part of Northern Ireland Adventureland Weekend £10 and half price outdoor activities are being offered for children as young as 3. On Saturday 23rd and Sunday 24th March you can take part in an affordable adventure that the whole family can enjoy. But if you think you’re just going to have to sit back and watch the kids have all the fun think again... all the events have been created so everyone can take part together, both the kids and the kids at heart! With all activities taken by fully qualified instructors and offered for a fraction of the normal price it’s time to get outside with the kids and have a hassle free and most importantly affordable adventure. The only question now is which activity to choose….?! Designed for ages 4 and up this event is perfect for both kids and families to have some fun on the water. Enjoy a paddle with experienced and friendly instructors in the middle of the stunning Lagan Valley Regional Park only minutes from Belfast City Centre. Enjoy an afternoon of adventurous activities together. Zoom down the zipline, aim for the bull’s-eye in archery, race to the top of the climbing wall and take part in some fun team games together! Suitable for children 6 and up. Forget the ferry; this high speed boat will add some excitement to a trip to Rathlin. See the stunning sights of the North Coast by sea as your skipper takes you to Rathlin where you will see the famous bird sanctuary and West Lighthouse before getting off to explore the island and zooming across the waters back to Ballycastle. No minimum age. Jump into a wetsuit and grab a surf board to experience a thrill the whole family can enjoy. A surf lesson aimed at all ages (from 6yrs old) to learn the skills and techniques needed to ride the waves on one of the best beaches in Northern Ireland. 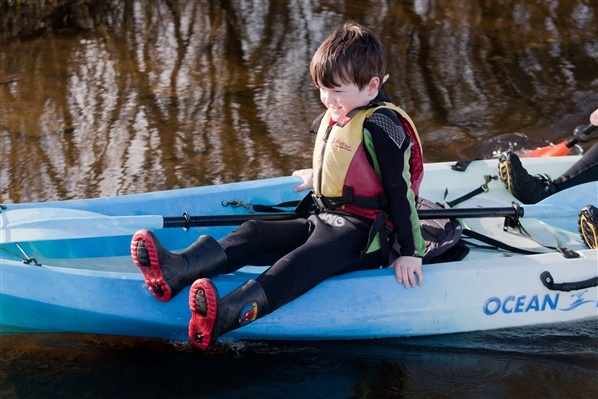 Take to the water at Gortin Lakes for a fun filled family canoeing session whilst learning the basic skills and techniques with fun games to build you and your family's confidence on the water. This session is great for the wee ones as kids from as young as 4yrs old can take part. Specifically designed for children aged 5 to 11 years, (minimum height 1 metre) this is an obstacle course with a difference. Your little ones will be harnessed up by friendly, fully trained staff and, after a safety briefing, they will be set free to roam the trees, with the opportunity to test their skills of monkeying around! A family day out with a difference - take an exciting trek through a enchanted woodland in search of some mystical treasure from a bygone era with a friendly Llama as your scavenging companion. Suitable for any kids able to walk along beside the Llama. Has your child always wanted to get on a horse? Now is their chance. They can enjoy a lead rein lesson especially for kids from 6yrs and up. Mum and dad can join in on the fun too by getting involved with the leading. Suitable for ages 4 and up, have a blast with the family and enjoy some quality time together. Take part in three fun-packed activities everyone can enjoy including archery, orienteering and crate stack climbing. Afterwards why not enjoy a picnic in the grounds of the Castle Ward Estate? Using a variety of boats - Canadian canoes and sit-on-top kayaks that are easy and fun to paddle, experienced instructors will show you a few of the basic strokes before heading off for a paddle under the watchful eye of St Patrick towards the Quoile Barrier. Look out for the seals as you make your way to the pier for a fun jump into the sea! Suitable for 6yrs and over. For all ages from 3 to 103, an exhilarating sightseeing boat tour of Strangford Lough. See the SeaGen, Angus Rocks Lighthouse and some of the many seals at Cloughy Rocks Nature Reserve. This trip is run at the best time of day to see The Narrows' unusual natural phenomenon - the surface whirlpools! See them spin as the tide rushes through. You might get to see a pod of porpoises or even a Basking Shark! An excellent trip available to anyone, young or old, which never fails to please. Wet bouldering is all about the water – make your way up a river, jump into pools and climb up waterfalls on this wet and wild experience all under the supervision of fully qualified instructors. This is one experience the kids (from 6yrs) won’t forget! Check out the Northern Ireland Adventureland Website for even more great family activities happening over the weekend. In preparation for the launch of the Davagh Forest Trails, the MountainBikeNI.com team were joined by local biker Mickey Regan to carry out a promotional photo shoot of the trails. Mickey is keen adventure racer and has biked all over the world, so no better person to guage opinion on the new trails @ Davagh! 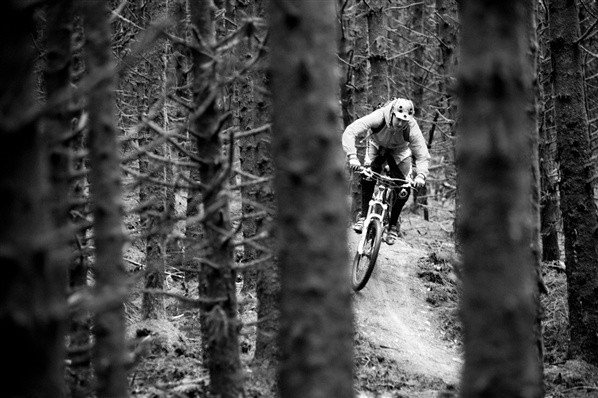 Davagh Forest is my local forest and probably the forest in which I really started my love of mountain biking. Davagh is situated in the Sperrin mountains between Cookstown and Draperstown. For years mountain bikers helped maintain a network of old walking trails that had fallen into disrepair through lack of maintenance and no use from walkers. As the trails were forgotten mountain bikers created a small series of trails to ride. For years locals campaigned to try and get some help to build a more sustainable network of trails in Davagh Forest with little success. This would all change with the help of Cookstown District Council, Outdoor Recreation NI (Formerly CAAN) local representatives and the Northern Ireland Mountain Biking Alliance. Years of talks, planning, let downs, highs and lows finally have paid off in 2012/13. Outdoor Recreation NI created the frame work in which Architrail would design the trail network. Planning permission was agreed, Forest Service Northern Ireland would allow Cookstown District Council control over the trail network and local contractors FP McCann would create the trails. 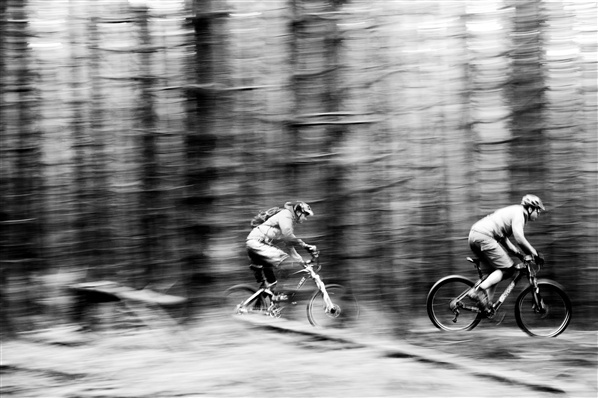 Building work on the trails is nearing completion and the marketing team from Outdoor Recreation Northern Ireland are now finalising their marketing strategy for Davagh Forest, Castlewellan and Rostrevor Mountain Bike Trails under the new MountainBikeNI.com brand. I was asked if I would come along to Davagh Forest on a photo shoot. The marketing team needed some mountain bike photos and I was delighted to help out. We spent the day on the new trails at Davagh and what a day it turned out. The trail network is fantastic. The standard of trails in Davagh Forest is on par with anything I have ridden in Scotland. It is a trail that doesn't leave you wanting. Perhaps a bit short at the minute but that leaves room for improvement. This will definitely be a big boost for the local economy. The trail designers Architrail and contarctors FP McCann have done a brilliant job. I will admit I was a bit skeptical when I heard who got the build contract mainly because this was the first time they will have produced trails like this. It would transpire that I had no need to worry because under the management of Phil Saxena of Architrail and his team they have really pulled it off. It is great for the economy that a local firm got the contract and had the ability to deliver a top class finish. Now they have the experience and the knowledge they can deliver more projects like this if and when funding is available. I am pretty confident you will see a massive boost to the area in this rapidly growing sport/hobby/lifestyle. 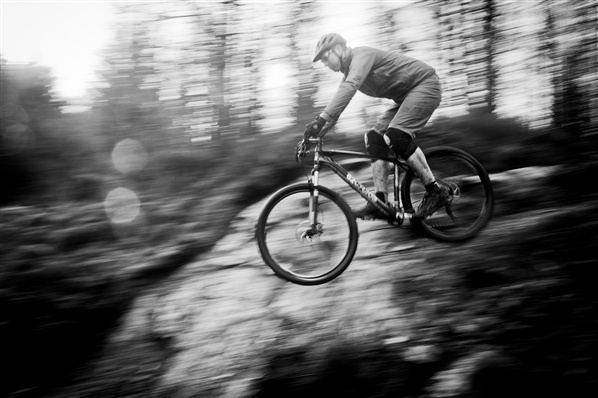 I am really looking forward to the trails officially opening on 10th April 2013. Well done to all involved and hopefully this is just the beginning. I am a bit of a Mountain bike fanatic. I ride most types of Mountain biking from XC, DH to All Mountain epics. I ride mainly for the enjoyment of the sport. Racing only occassionaly to keep me on my toes. For me it doesn't mater if I am ridding off the side of a Rocky Mountain, up to the hubs in mud or on a trail centre all weather surface. Being happy on the mountain bikes in the open air is what it is all about. With the long cold winter months hopefully behind us, it's time to start looking forward to the season of spring and there is no better way to enjoy the improving weather and longer days than by walking in Northern Ireland. To make the most of walking in this season, it is always best to be prepared so in light of this The Outdoor Shop has put together a guide on how to best gear up for this spring. Last year saw the wettest April for over a century. Although this spring we may not be expecting quite as much rain, when living in the UK it is always useful to prepare for rainy weather. When hiking though the great British countryside it is always recommendable to do everything you can to avoid spending hours trekking in waterlogged gear which is not only uncomfortable, but if you get too cold can also be bad for your health. Prepare for this year’s April showers by re-waterproofing your walking gear. There are plenty of products out there that are specifically designed to waterproof your outdoor clothing from sprays to washes with different products specialising in different types of fabrics. When walking outdoors it is always advisable to wear sensible footwear. As Britain transfers from winter to the spring, we hope with this will come slightly warmer weather. It is important to treat your feet with care and to wear the appropriate footwear for the weather outside. So if you have been using thick walking boots throughout the winter months, it may be worth getting some walking footwear that is more breathable and suitable for warmer weather. There are plenty of walking shoes out there that are suitable for the spring time. Look for shoes with qualities that are lightweight, waterproof and breathable; everything you need in a shoe when walking during the spring season. As with the other seasons, during spring you need to take enough precaution to protect yourself from insects that could cause you harm. In the UK, when protecting yourself from insects, pay particular attention to ticks as being bitten by one of these tiny creatures can cause lyme disease for humans. During spring when the weather gets warmer, ticks should be paid particular attention to when walking through tall vegetation. Covering yourself and your clothes in a good insect repellent will protect against ticks. Although spring is warmer than winter, it can still be just as wet and rainy. Investing in a lightweight waterproof jacket will be perfect for those spring days where the weather is mild but rainy. So in replace of your thicker and warmer coat you have been using throughout the winter months, invest your time in looking for a jacket that will keep you at the right temperature but also dry. Many jackets now come with Gore-Tex fabric which is perfect for your springtime walks. With a microporous structured membrane, each microscopic pore is roughly 20,000 times smaller than a drop of water. What this means is that outside moisture from rain or snow can’t enter the membrane, keeping you dry. Not only this but the pores on the Gore-Tex membrane are 700 times larger than water vapour molecule, meaning any perspiration can escape, keeping you comfortable on those warmer spring days. Whatever season you are out walking in, taking plenty of water is always essential. As well as seeing a lot of rain, the spring weather can also reach heights of 32°c (very rare to reach these temperatures but it has happened). So whatever the weather, make sure you are at no risk of dehydration and purchase a good size water bottle. Alternatively, hydration systems can hold up to 4 litres of water and are perfect for those extra-long hikes remote from natural clean water supplies. Spring may not be quite warm enough for shorts and t-shits, but it is certainly warm enough to ditch the fleeces and warm trousers. For those in-between spring days where the weather is warm but not quite warm enough to go out without a jacket, a body warmer is the perfect compromise. Body warmers are warm enough to keep off the chill of a cold breeze, but are small enough to fit into a rucksack. As the weather generally starts to get warmer in spring, stay comfortable and chose clothing made of wicking fabrics. We may now be looking forward to better weather, the past 12 months can demonstrate just how quickly the weather can turn. You can start off your trek on a beautiful sunny morning, but by early afternoon, the heavens have opened and you’re fighting your way through a thunder storm. When venturing out away from any form of shelter, it is best to prepare for all situations. A bothy bag will provide you with emergency shelter which can allow you to read your map or eat your lunch when nature turns against you. This article was produced by The Outdoor Shop, a leading independent retailer of outdoor clothing and equipment. Lucy is a copywriter for the Outdoor Shop. Established in 1981, The Outdoor Shop is based in Stacey Bushes on the North West tip of Milton Keynes. Retailing through both a high street shop and via the Internet, they are one of the countries leading independent retailers of technical outdoor clothing and equipment.